Savvy electronics shoppers know Micro Center as the go-to retailer for mouthwatering CPU deals if you’re lucky enough to live near one. The company’s first-ever homegrown gaming laptops continue that devotion to damned good prices. Despite packing a full-fat GeForce GTX 1070 and other high-end hardware, the aluminum-clad PowerSpec 1510 costs a mere $1,300, and the PowerSpec 1710 just $1,400. (With in-store pickup only, of course—this is Micro Center.) That’s surprisingly little cash for such potent portable PCs! Nvidia’s gameplay-smoothing G-Sync technology is disabled by default though, making you jump through hidden and arcane hoops to get the best experience on the PowerSpec laptops—and one of these is definitely the better buy. The 15.6-inch PowerSpec 1510 and 17.3-inch PowerSpec sport identical core hardware. Externals are another story. The Micro Center laptops use two very different Clevo cases, and that leads to two wildly different user experiences. We’ll discuss the port selection as part of the overall design talk in a later section. You won’t find any lightweight Nvidia Max-Q subtlety here. The GeForce GTX 1070 lurking inside is the full-fat version, and the PowerSpec laptops are old-school bruisers at an inch (or more!) thick and nearly 7 pounds. of heft before you add in the power brick. That raw bulk lets Micro Center cram top-of-the-line hardware into the PowerSpec 1510 and PowerSpec 1710. With a Core i7-7700HQ, 16GB of RAM, and a helpfully fast Samsung 960 EVO NVMe boot drive, these beasts were built to spit out blistering frame rates. But bizarrely, G-Sync—the Nvidia technology that synchronizes the refresh rate of the GPU and display to eliminate tearing and stuttering—isn’t active by default. The Nvidia Control Panel won’t let you turn it on, either. What? You need to dive into the PowerSpec laptop’s throwback BIOS to activate G-Sync. As it turns out, the PowerSpec laptops ship with Microsoft Hybrid Graphics mode enabled by default. Hybrid mode switches off the discrete GPU and shifts the workload over to the Intel CPU’s integrated graphics when face-melting visual power isn’t required. It saves battery life, but G-Sync won’t—can’t—function using Hybrid mode. G-Sync demands secret sauce from Nvidia GPUs 100 percent of the time. To activate G-Sync, you need to boot into the system BIOS and head to the Advanced tab. There, select Advanced Chipset Control and change the “MSHybrid or DISCRETE Switch” option to Discrete. Reboot the PC, give the system a second to think, and you’ll receive a prompt to enable G-Sync in the Nvidia Control Panel. Fortunately you’ll only need to this once—but it’s ludicrous that you need to do it at all. 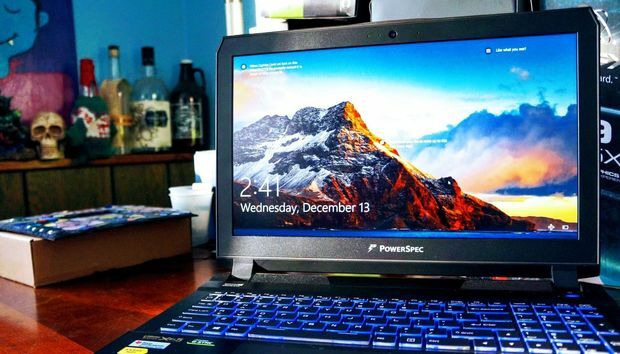 The PowerSpec laptops ship with a flagship feature disabled. Worse, the activation’s hidden behind an arcane process that’s never made obvious to end users. And get this: Switching to the discrete GPU bumps the PowerSpec 1710’s display refresh rate from the default 60Hz up to 75Hz. (No such luck on the PowerSpec 1510, alas.) 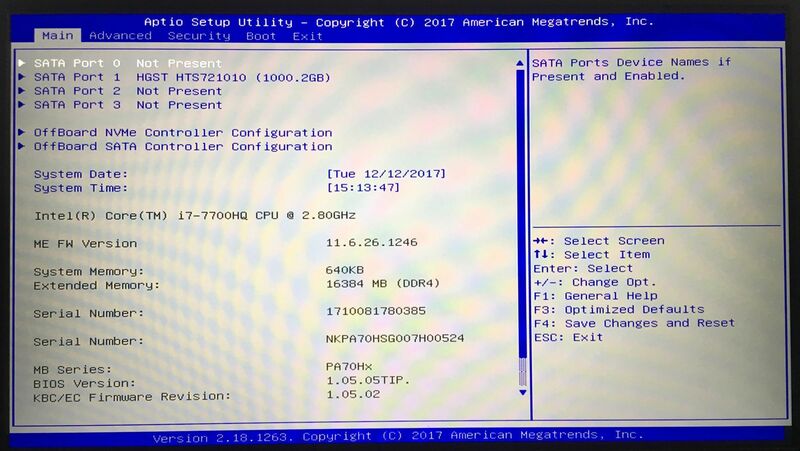 I’ve never seen a laptop configured this way and honestly, the only reason I puzzled out the solution was because I saw an Intel graphics option while right-clicking the desktop and was savvy enough to recognize what that indicated. It’s not consumer-friendly whatsoever. Once you’ve gotten that all squared away, the results are spectacular. Both Micro Center notebooks boast vivid displays with wide viewing angles. The PowerSpec 1510 is no slouch with its better-than-average 317 nits of brightness, but the PowerSpec 1710 maxes out at an eye-searing 411 nits—easily one of the brightest displays we’ve seen, alongside the Alienware R15 and monstrous Acer Predator 21 X. With G-Sync active, gaming on these displays with the GTX 1070’s raw power is nothing short of glorious. 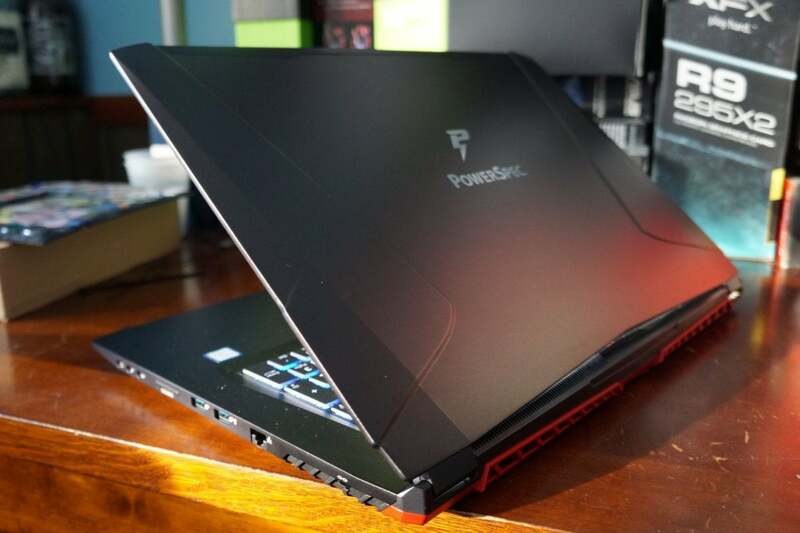 The PowerSpec laptops rely on Clevo cases. These are classic big, heavy gaming laptops—though far from the heaviest we’ve seen. Both designs sport a slick-looking (and fingerprint-prone) black casing, but differ greatly in other aspects. Ports of the left edge of the PowerSpec 1710. Ports are handled differently on the larger PowerSpec 1710. You (thankfully) don’t find any connections on the rear. On the left edge, there’s power, HDMI, a pair of Mini-DisplayPorts, a pair of USB 3.1 ports, and a single USB 3.1 Type-C connection complete with Thunderbolt 3 support. The right edge packs another pair of USB 3.1 ports, SD card and Kensington lock slots, ethernet, and mic/headphone/line out jacks. The PowerSpec 1710 (left) is thinner than the PowerSpec 1510 (right). The 17.3-inch laptop naturally measures in a bit wider and longer than its smaller cousin, at 16.5 x 11.5 inches. Despite that it appears sleeker to my eye due to being one inch thick—a quarter-inch thinner than the PowerSpec 1510. The decision to reduce the height may not have been a smart one, though. The PowerSpec 1710 suffers from reduced performance during extended usage, while the PowerSpec 1510 doesn’t. We’ll cover that in detail during the performance section. The PowerSpec 1710’s rear exhaust is red, inexplicably. The angular rear exhausts on the PowerSpec 1710 are painted an obnoxious “gamer red” color that coordinates with a pair of red RGB lights on either side of the triangular power button found front and center underneath the display. The PowerSpec 1510 sticks to black aluminum throughout, augmented by blue lighting under its keyboard and a more subdued rectangular power button. That better fits my personal tastes, though both laptops include software that let you customize the keyboard’s RGB backlighting by region. 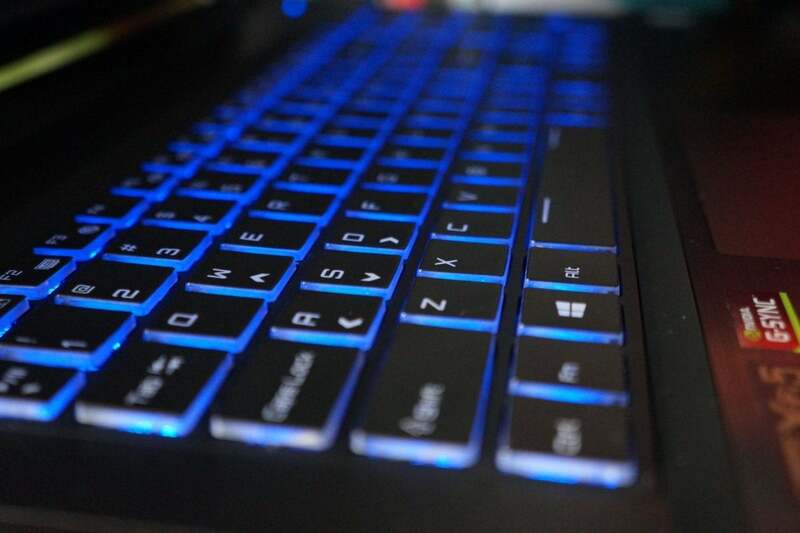 Both PowerSpec laptops sport standard-issue Clevo keyboards. They’re as eh, okay as ever. I prefer the deeper key travel of the PowerSpec 1510; the shallower keys of the PowerSpec 1710 bottom out more frequently and feel less comfortable. 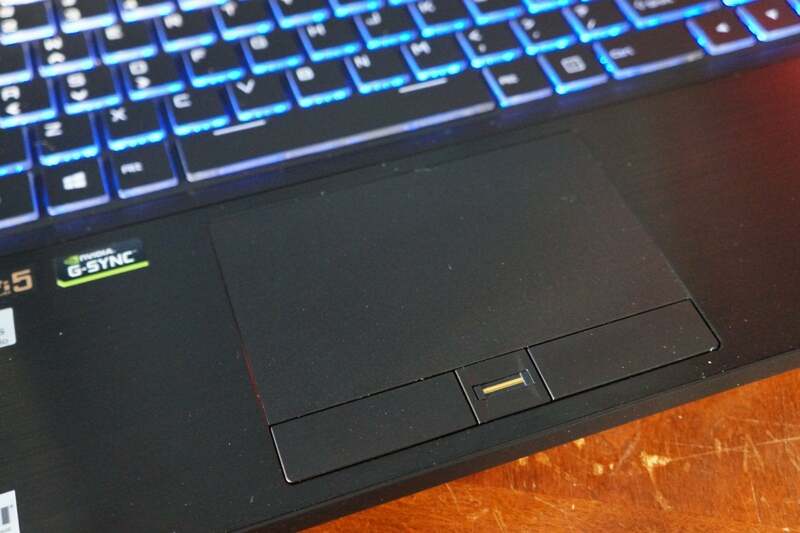 The touchpads prove smooth and accurate, though the buttons are a bit too mushy—another common Clevo complaint. The PowerSpec 1510 embeds a fingerprint reader between those buttons, while the PowerSpec 1710 lacks any biometric support. The PowerSpec 1510’s touchpad includes a fingerprint reader. Audio differs between the two laptops as well. SoundBlaster handles the PowerSpec 1710’s audio, and the results are decent. The laptop gets nice and loud, but kind of blare-y at high volume. The audio can also sound curiously flat sometimes, though it’s clear overall and has a decent bass punch. The PowerSpec 1510 also packs SoundBlaster tech, but it’s bolstered by an ESS Sabre HiFi DAC and Texas Instruments Burr-Brown Audio. It sounds surprisingly good, with crisp, clear tones. Deep bass adds a warm feel. But the maximum volume is also surprisingly quiet—you won’t be cranking this notebook to 11. As ever, we recommend buying a nice gaming headset to pair with your gaming laptop. The $1,300 PowerSpec 1510 and $1,400 PowerSpec 1710 deliver a hell of a lot of bang for your buck, be it in gaming, content creation, or whatever. Finding laptops packing this level of hardware for under $1,500 is almost impossible, especially with G-Sync (eventually) included. The similarly spec’d Alienware 15 R3 costs $2,000 on Amazon, for example, though its 1080p display refreshes twice as often. Hell, laptops with a less capable GTX 1060 sometimes cost more than these Micro Center machines. Let’s take them to the test bench. Maxon’s Cinebench R15 measures raw CPU performance, and the more threads you can throw at it, the happier it is. Many of today’s high-end gaming laptops lean on the same Intel Core i7-7700HQ, and thus deliver similar results with some minor variations due to cooling design differences. Only the beastly Alienware 17 ($2,599 as configured on Dell) edges ahead of the crowd thanks to its more powerful Core i7-7820HK CPU. Deeper differences between the design of the PowerSpec 1510 and PowerSpec 1710 became obvious in our next test, which mostly focuses on CPU performance as well. 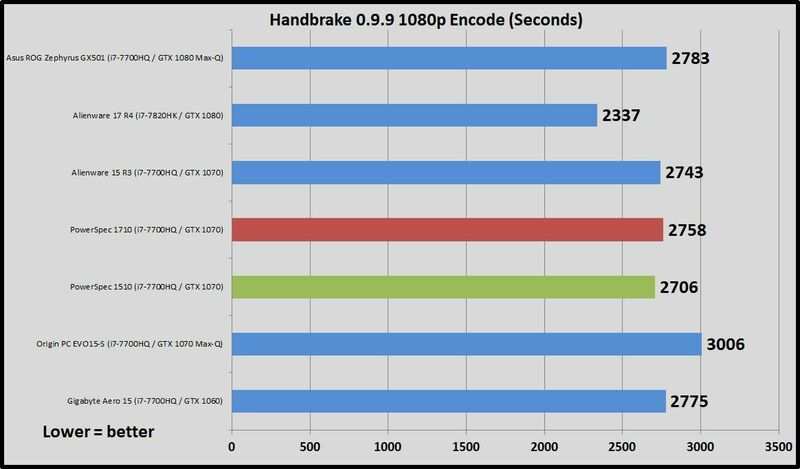 The Cinebench test has a short run time, but the file we encode in our HandBrake test (which uses an older version of the software) takes around 45 minutes on a quad-core processor. The extended duration reveals how a laptop’s temperature throttling affects performance over time. The thicker PowerSpec 1510 delivers the best scores among the legion of Core i7-7700HQ laptops; the PowerSpec 1710 clocks in 52 seconds slower. 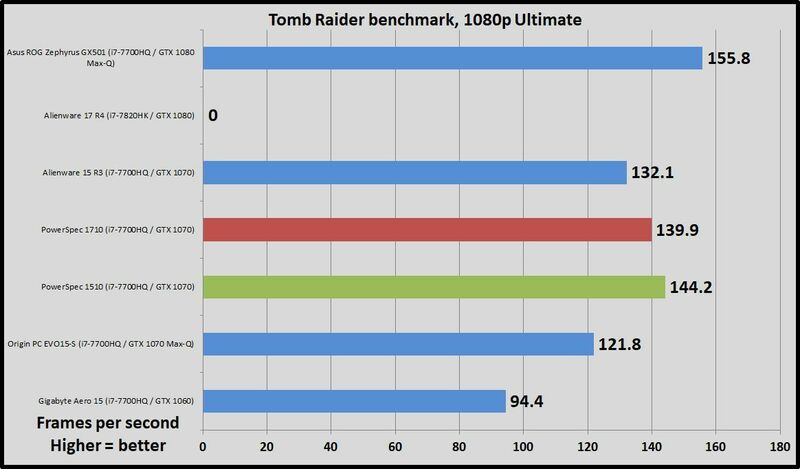 Sure, that’s only a minute or so's difference between the two in reality, but we’ll also see endurance concerns during gaming benchmarks that stress both the CPU and the GPU. Speaking of which, graphics are the star of the show in gaming laptops. 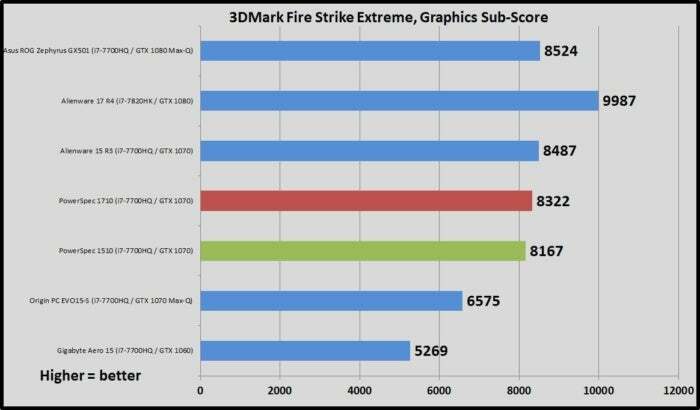 We test the visual chops of gaming laptops using 3DMark’s Fire Strike Extreme benchmark. 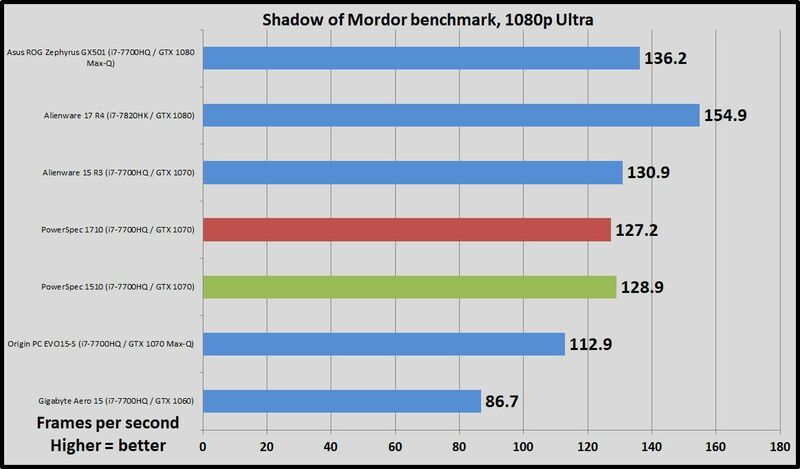 Specifically, we rely on the Graphics sub-score, which focuses on pure GPU performance. The overall score takes more hardware factors into account and is less useful for our needs. Here you see the might of the fully enabled GeForce GTX 1070. 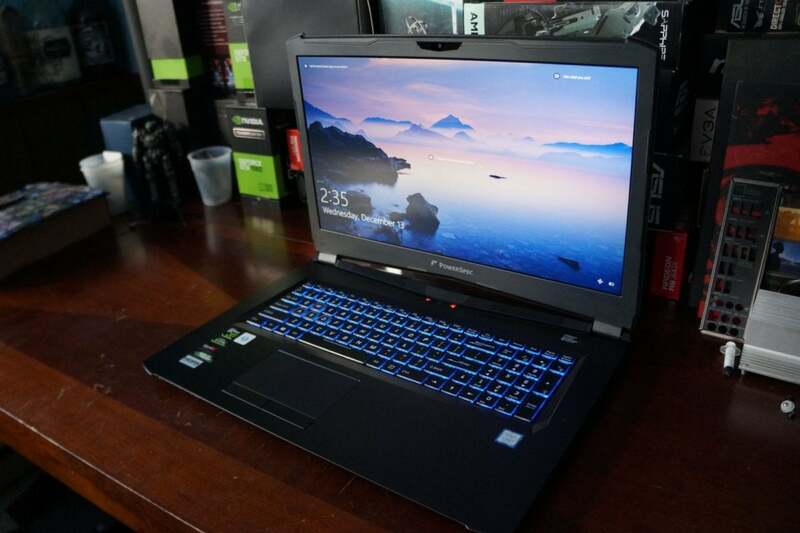 The PowerSpec laptops turn in graphics scores close to the similarly equipped $2,000 Alienware 15 R3's. But Micro Center’s laptops thoroughly trounce rival notebooks packing Nvidia’s new GTX 1070 Max-Q chip for a fraction of the cost, like the $2,199 Gigabyte Aero 15X and $2,375 Origin EVO15-S. Max-Q enables more powerful GPUs to squeeze into thin and light frames, but need to be severely underclocked to achieve that portability. In fact, the unleashed GTX 1070 inside the PowerSpec 1510 and 1710 are only a hair slower than the GTX 1080 Max-Q found inside the Asus ROG Zephyrus—a premium Max-Q flagship that, at $2,700, costs nearly double that of Micro Center’s machines. That trend continues when it comes to actual gaming benchmarks. 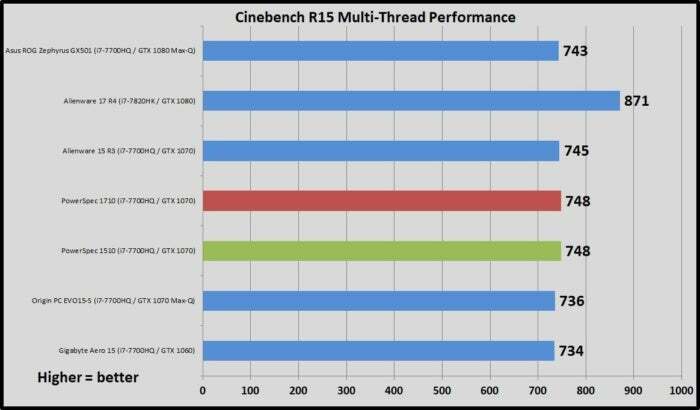 Note that the PowerSpec 1510 comes in slightly ahead of the PowerSpec 1710 across the board—that’s the difference in design and thermal throttling coming into play. 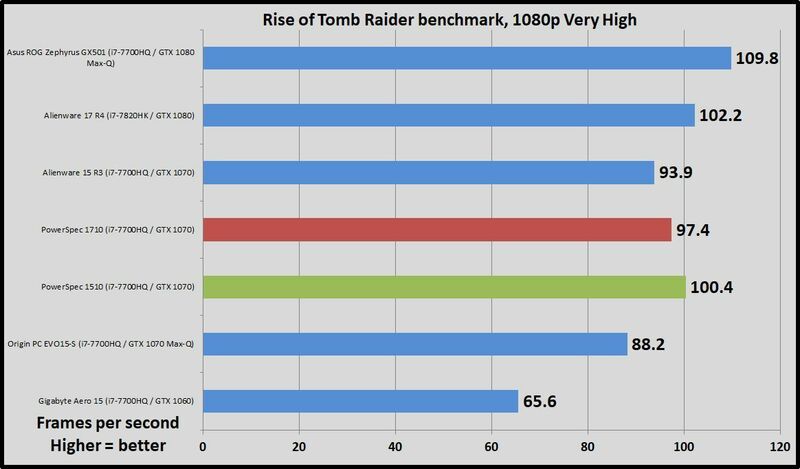 Like Cinebench, gaming benchmarks tend to be pretty short, so I repeatedly run the Rise of the Tomb Raider benchmark for an hour, noting the differences in frame rate from the first to the last run. The PowerSpec 1510 delivered essentially the same experience throughout, with frame rate fluctuations inside of 1 frame per second. But the extended test hammered the larger PowerSpec 1710. It started off hitting 97.42 fps in the game; after an hour, it hit 92.31. That’s a 5-percent performance hit under extended load—not something you see very often. The PowerSpec 1510’s fans aren’t overly quiet when the laptop’s under load, but they aren’t overly loud either. That’s about the best you can ask for in a gaming laptop. On the other hand, the PowerSpec 1710’s fans are much more audible, and emit an annoying high-pitched whir. You can’t hear either with gaming headsets on, but the barista at Starbucks would like you a lot more if you left the PowerSpec 1710 at home. 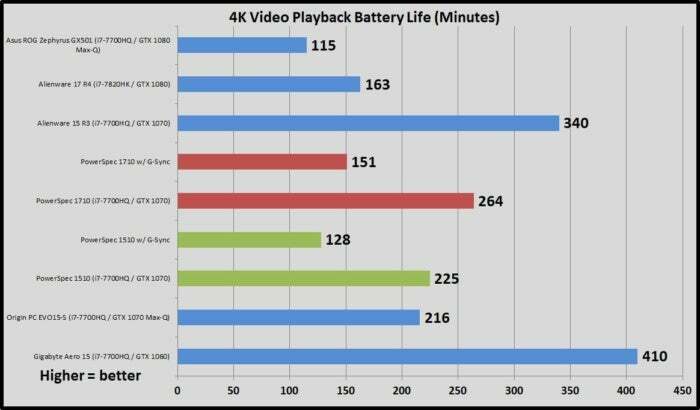 We test battery life by looping a 4K video in Windows 10’s built-in Movies & TV video player, with the display brightness set to 250 to 260 nits—that’s bright enough to watch comfortably in an office environment. In the stock configuration, with Microsoft Hybrid Graphics enabled, the battery life is actually pretty darn decent for a gaming laptop. The PowerSpec 1710 and its nearly 67 watt-hour battery lasts 264 minutes (4 hours, 24 minutes), around 39 minutes longer than the PowerSpec 1510, which has a smaller 60Whr charge. Activating the discrete graphics to get G-Sync up and running devastates the endurance of Micro Center’s laptops, as you’d expect. With the GTX 1070 running constantly, the PowerSpec 1510 taps out at 151 minutes (2 hours, 31 minutes), 97 minutes sooner than it did with Hybrid Graphics enabled. The PowerSpec 1710 dies at 128 minutes (2 hours, 8 minutes), a whopping 113 minutes—nearly two full hours—sooner than before. 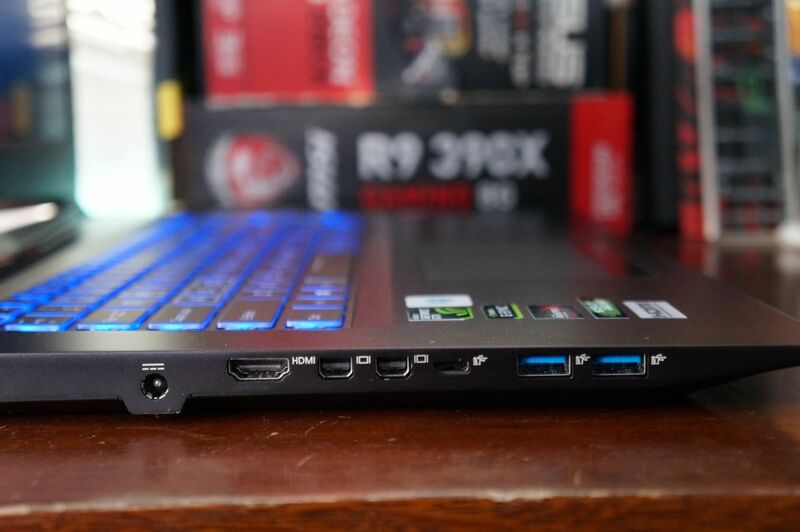 Those are among the worst results we’ve seen in a gaming laptop. If you plan to be out on the road for the day and don’t want to drag your charger along with you, consider switching back over to Hybrid Graphics. Should you buy the PowerSpec 1510 and 1710? Micro Center’s $1,300 PowerSpec 1510 and $1,400 PowerSpec 1710 deliver a staggering amount of bang for your buck. 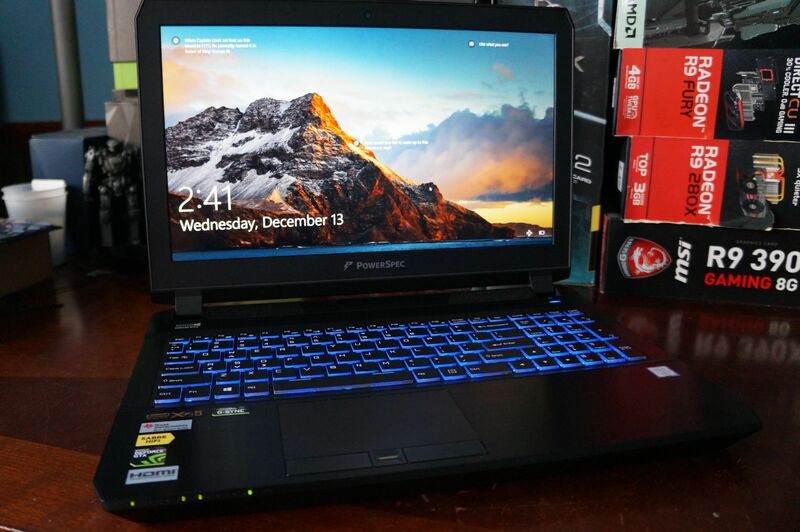 Laptops with beefy hardware loadouts like this typically cost several hundreds more, and often cross the $2,000 range. Seriously: These are both damned, damned good deals if you want a powerful gaming notebook without breaking the bank. The exceptional displays and aluminum exteriors are just desserts after the hardware buffet. The PowerSpec 1510 is the better buy. The low cost comes at a price, though. These are prototypical big, heavy gaming laptops. The decision to ship them with a flagship feature like G-Sync disabled and hidden away behind arcane BIOS menus is downright perplexing, even taking G-Sync’s battery life hit into account. The PowerSpec 1710 also suffers from an annoying fan, more overtly aggressive “gamer” aesthetics, and a thermal profile that can result in noticeable performance degradation during extended use. On the whole, the PowerSpec 1510 delivers a more well-rounded experience with no serious flaws. I’d heartily recommend it over the PowerSpec 1710 even if you tend to lean towards larger screen sizes. But both of these are downright steals if you live near a Micro Center and are able to pick one up. $1,300 for all this is ridiculous. There’s no GTX 1070-equipped laptop we can even point to as a rival in this price range. If you wanted to get this level of power in a thin sub-five-pound laptop, you’d need to step up to a GTX 1080 Max-Q machine like the Asus ROG Zephyrus, which costs $2,700—more than twice the price of Micro Center’s chubby, cheap offerings. Just be sure to enable G-Sync for the best gaming experience—and maybe disable it again if you wander away from your charger.